If your nose, fingers, and toes are cold, it is a sign that your body does not have enough energy to do all it needs to do AND keep your extremities warm. 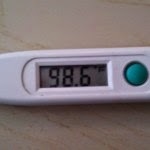 Your core body temperature really should be 98.6°. The warmer your body is, the better everything functions. So, how do you warm your body up? Starch, sugar, salt, saturated fat. Think of a piece of toast with butter and sugar. Real dairy butter and real sugar. Try it next time you are cold. It may take a few pieces to warm you up, but it will work. Here is a great article I found this morning that goes into detail about broken metabolism and how to fix it. With one caveat, I don't agree with her position on avoiding grains.